1. Cut 2 1/2" inches off the ends of one giant craft stick. 2. Cut three tape lengths 3-inches long. 3. Wrap pieces of tape around the flat end of the 2 1/2" craft stick so that the tape is one-inch below the end. 4. Line up the 2 1/2" craft pieces at the end of a giant craft stick so that one is on the bottom and one is on the top. 5. Cut another 3-inch piece of tape and wind it around all three craft stick pieces so that it covers the tape hanging from the end of the cut crafts sticks, but not the craft sticks. 6. 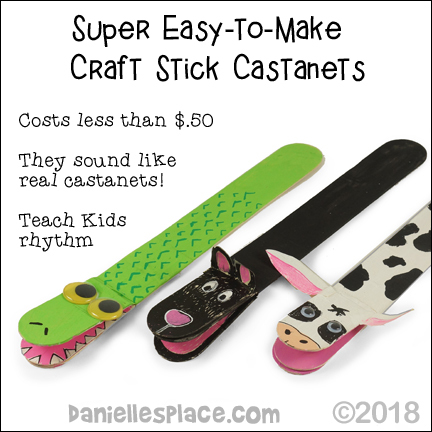 To finish paint the castanets or clappers with acrylic paint and decorate them with paint markers. Add googly eyes and ears. 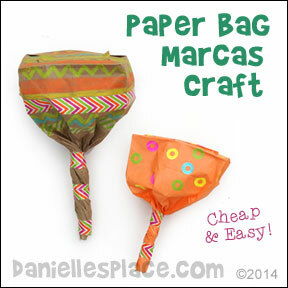 Children of all ages will love making these paper bag maracas. 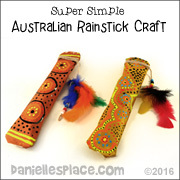 They are super easy and cost only pennies to make. Warning - these maracas are very loud! 1. Decorate the bottom third of a paper lunch bag with markers, crayons, paint, or colored pencils, and add decorative tape or circle page reinforcements. Logan loved decorating his paper bag with stickers and paint. He especially liked placing the confetti in the bag to make the rattle sound. 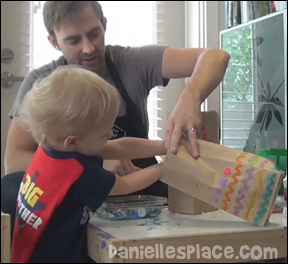 Watch how Logan makes the paper bag maracas with his dad on Logan's Life to see how your child might like to make this craft. 1. Cut 12" lengths of ribbon and use the edge of your scissors to make them curly. 2. Place a hand full of corn, rice, or dried beans on a paper plate and place another paper plate over the plate, front to front. Staple the plates together. Color the outside of the shakers with markers or crayons. 3. Punch holes all the way around the edge of the shaker thread the ribbons through the holes and tie. 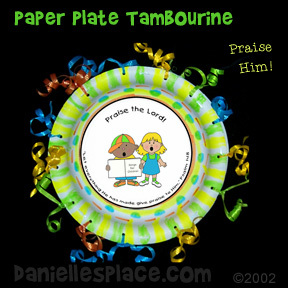 A pattern for this craft that says, "Praise the Lord!" 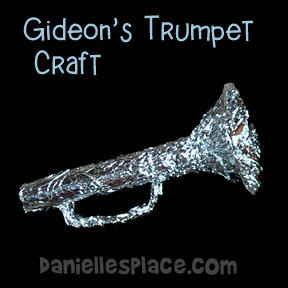 and has the Bible verse, "Let everything he has made praise him." Psalm 148:5 is available on The Resource Room. Go to the "Praise The Lord" Bible lesson for the pattern. 1. Use a pencil to trace the end of a paper towel roll onto the bottom of the paper bowl. (If you don't have paper towel tubes, you can roll up pieces of card stock into tube shapes.) Make a slit all the way across the circle cutting the circle in half. Make another slit the opposite way cutting it in half again. Keep doing this until you have little wedge shapes all the way around the circle.